This has been an interesting month for me. I was diagnosed with Shingles and fought that battle, welcomed a new grandson, assisted with our leadership program in New Zealand and learned a lesson or two. I’ll save some New Zealand lessons for another day. As we enter April, I well remember that glorious (and daunting) April 1st 1988, when our company was born. We now enter our 28th year in business—I guess we beat the odds. As I think back over the years, I believe the absolute key to any of our success (aside from the blessings of Heaven) is to have a culture of transparency and trust. Our teams have not always gotten along perfectly, but we have always kept our promises and worked hard to inculcate a culture we believe in. We have healthy conflict and hold one another accountable. We succeed as a team and don’t focus on individual recognition. I once had an experience where one of our officer-associates figuratively banged his fist on the table “don’t you know I’m a [insert official title here], I demand more respect”. That person is no longer with our company, but the point is, we don’t hang our hats on protocol—we put our value in each other and the patterns of success we have established; which we call our culture. Folks can actually feel this culture when they visit our offices; that we really are “real” and we really do “care”. In other words, this just isn’t me talking—-our success transcends any “one”, and belongs to the entire body—-both now and in the past. In our dog eat dog world, many business owners don’t give a hoot about the heart of the people; they care only about how the bottom line can bless them personally. Their ladder-climber “yes” people mirror the owners as they wield a sword of fear. This builds nothing long-lasting. When we shift to the concepts of trust, with an attitude of gratitude and a desire to give back; we feast at the table together, and not in private chambers while the rank and file eats the crumbs outside of the chamber door. 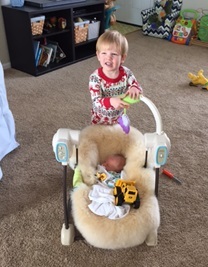 With the new grandson who recently arrived, it is always a hold your breath moment to see how the next older sibling treats the new arrival. In this case, when Noah was just two days old, Elijah shared his greatest treasures with his new born brother. He placed his earth moving equipment in the tiny bassinet. We know the feelings of his heart will not always match his actions—-but he is off to a pretty good start. In our business culture, we can learn a lot from this example. Sometimes we don’t always feel like sharing that amazing “secret of success” (not caring who gets the credit), sometimes we go through the actions of trust, but our heart and mind are not completely aligned yet. Sometimes we have a hard time with change and we react instead of adapt. One of my favorite authors, Robert Fulghum, wrote a book entitled “All I really needed to know, I learned in Kindergarten”. Seems like the title of his book is very true. Developing a successful culture and adopting success principles is a life-long pursuit and it’s never too late to start. Sometimes it’s a matter of connecting to what we know is right; even though our adult lives have fogged the mirror of truth. Let’s try to always welcome the newness of change, give willingly of our “treasures” with a focus on team success and not individual glory, and always keep our promises. Let’s return to our roots and live as adults the lessons we learned in our infancy. I hope we are never dissuaded by the negative drum beats of the few and continue to partake in the great opportunities available for the many. Lastly, for those who are near the retirement age; I highly recommend the Shingles Vaccine! Some things we don’t need to learn by experience.